The Inner Fire pendant from Tech Lighting has grown in popularity since its launch in 2000 due to its rich colors and simplistic beauty. 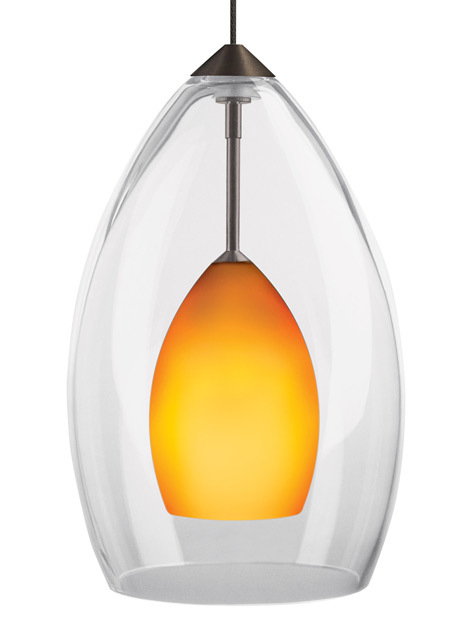 The clear teardrop shaped glass surrounds a frosted raindrop colored diffuser concealing the lamping inside. The Inner Fire pendant sets a tone of modern sophistication with five bold color options and three high end finishes. Scaling at 7.3” in length and 4.5” in diameter the Inner Fire is ideal for kitchen island task lighting, dining room lighting, and countless commercial lighting applications. The Inner Fire pendant is the largest in a family of five Fire pendants available from Tech Lighting – simply search for the Inner Fire pendant to find its closest relatives. Pair this pendant with the Monorail system by Tech Lighting for greater design customization.